When I bring up the idea that judgment is the first compulsion that leads to all of the other emotions and behaviors we struggle with when we’re sinking into mental health challenges, people can often become very protective of their judgment skills. We can always think of ways our ability to judge has helped us. We’ve gotten positive feedback from others. Maybe our careers depend upon our judgment skills. But it’s not that judgment is necessarily bad. It simply has natural consequences. And if we don’t learn how to use that superpower and choose when we use it, then we’re like a superhero walking around looking at everything with laser vision. 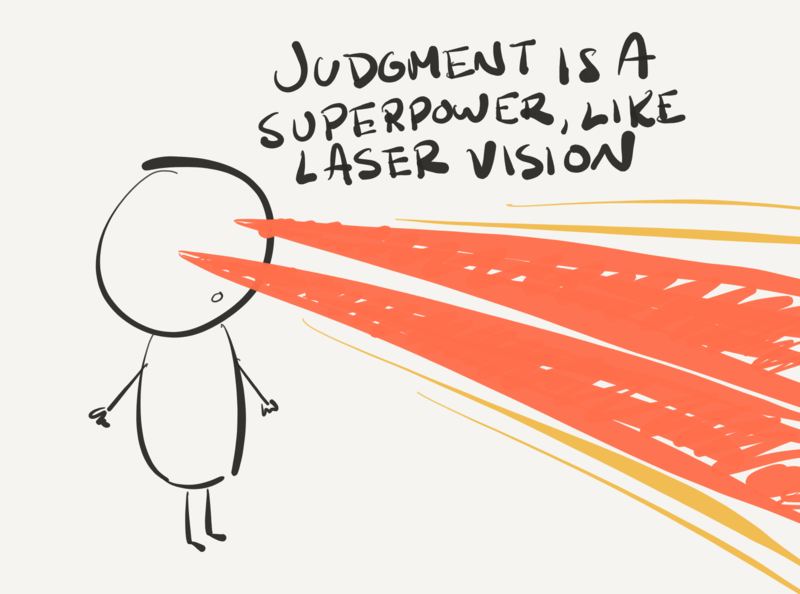 Learning to practice non-judgment is an equally amazing superpower. But it requires just as much practice as we put into judging. Here’s four weeks of exercises to help you begin to see that you can choose what you do with the equipment in your skull. Explore these exercises and then build on them. If you have any questions about taking these practices further or how to apply them to specific challenges you’re running into with therapy, post your questions in the comments below. Go about your days as you normally would and notice how you judge others, yourself, how the thoughts come up in your head, what you judge, where you judge, etc. Notice how your brain likes to stick labels on things. Notice how those labels affect you. You might do this a couple of times. Understand the patterns of judging your brain likes to get stuck in over and over again. Go about your week with the intention of keeping your mind with you in the present, not running around to slap labels on everything. What we want to do now is start to show our brains there’s other things we can choose to do. When you’re going into a situation where your brain likes to judge, give it something to be aware of. If you noticed it often judges people on the street, you might decide you’ll walk down the street being mindfully aware of the sensation of your feet on the ground. Or if you noticed it often judges you in the mirror when you’re getting ready in the morning, you might choose to enjoy the smell of your toothpaste or the sensation of a cream on your skin. Whatever it is, know what you’ll choose to do in advance. If your brain runs off into judging mode, that’s totally fine, gently bringing it back to whatever it is you’d rather pay attention to at that moment. Keep practicing the skills from the previous weeks–noticing how your judgments come up, going into situations with an intention to practice something mindfully. As well, this week, trying being grateful towards things for no reason whatsoever. Love a t-shirt, thank a door knob, appreciate your nose for existing. Explore what it’s like to express gratitude towards a thing or a person without needing a reason, without needing to judge it first as beneficial or “good”. Keep practicing all of the skills from the weeks before and incorporate them into doing things you value when judgments want to interfere. This is an opportunity to target the beliefs that fuel the judgments. For example, if you’re at a networking event to meet people and you’re about to speak to somebody but your brain throws up a judgment like “they probably won’t like you” or “you don’t feel ready to speak with people yet”, go and speak with them. Practice being present and not getting caught up in more judging. You can feel grateful for anything there for no reason. Practice this with whatever it is you value doing but with which judgments often interfere. Smash through those judgments with presence and gratitude. 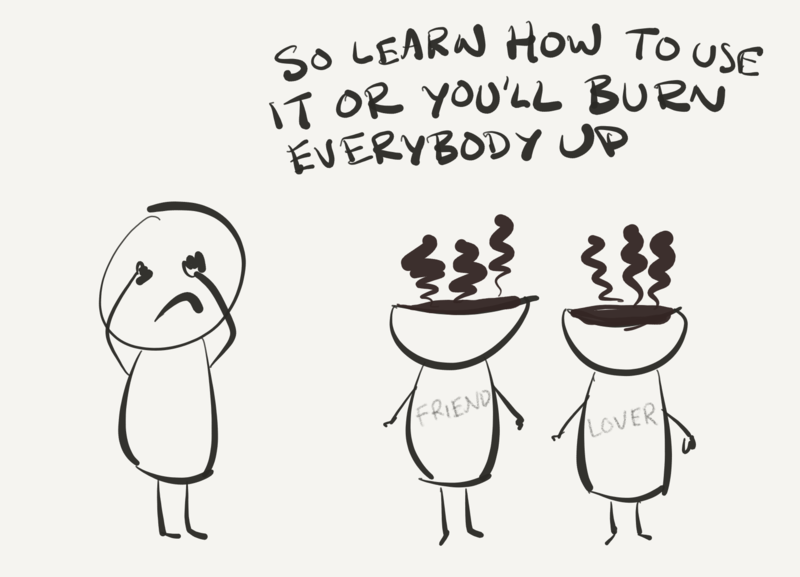 Your brain will learn you’re not paying attention to them anymore so there’s no point throwing them up.